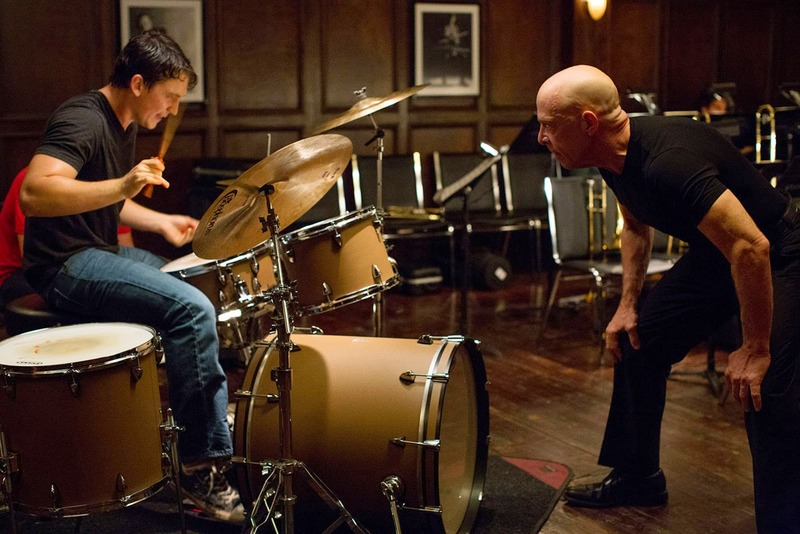 Andrew Nieman (Miles Teller), a promising drummer at “Shaffer” a highly competitive and prestigious music studio. He plays in the band, they practice. They sound pretty good, relaxed, convivial, the teacher is not demanding. Play well, don’t play well, it’s up to you. In walks “Fletcher” (J K Simmons), the air is sucked out of the room, the atmosphere changes. Fleeting opportunities are given and snatched away within seconds, some don’t get to play a bar of music. Is anyone really good enough to play in “Fletcher’s” elite studio band, probably not. If selected, this might be the least of your worries. “Fletcher” has a particular teaching style, a “Stick and even bigger stick” approach. There are no carrots. Ever. Working on the principle that unless students are challenged, how can they improve. How can they realise their full potential without being pushed and stretched to the limit. Where the line is drawn of course, is the problem. “Fletcher” not only crosses the line, he swears and throws instruments at it. He deploys what can only be described as mental and physical torture as a motivational technique. Is it ever worth crushing the many in the crucible of endeavour, in the hope that one shining example might just rise from the ashes? Fletcher clearly thinks so and to achieve that aim, acts like a psychotic drill sergeant with Tourette’s. Simmons with a best supporting actor Oscar win, will probably never be better or have as many hopelessly non-PC comments quoted back to him. Miles Teller, unrewarded is all but equal in a hugely demanding role both from a mental and physical aspect. The sheer physicality of extended drumming at the highest level is amply demonstrated in devastating slow motion. Like any competitive sport or creative endeavour, how much are you prepared to give or sacrifice to be the best, the very best. Are the most damning words in the English language really “good job”. Would it be enough to be “just good”, maybe if you have a relationship, family and other interests. But what if you don’t want any of those distractions to restrict your true potential? An excellent film, arguably not for everyone and posing more questions than answers. Simmons has created a monster, whether justified or not is up to the viewer to decide.